BEVERLY – There is something about a life that blazes brightly before being snuffed out at a young age that inspires and fascinates writers and composers. James Dean, JFK and Marilyn Monroe are three good examples. Lyricist Tim Rice was a young boy when he learned the story of Maria Eva Duarte de Perón, the second wife of Argentinian President Juan Peron. It was a story that he decided could be the subject of a full-length musical. 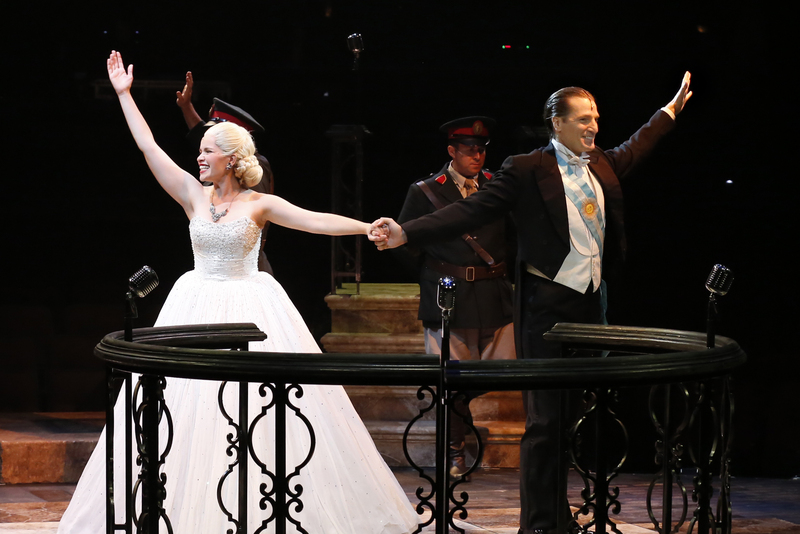 He and Andrew Lloyd Webber created the musical “Evita,” now being presented in a stirring production at the North Shore Music Theatre through Oct. 8. Director/choreographer Nick Kenkel has earned his stripes directing and choreographing several well-received NSMT productions, and the tangos and paso dobles in “Evita” are right in his wheelhouse, the sleek and sensual ensemble of dancers doing full justice to his choreography. He has also developed an obvious feel for what works in NSMT’s in-the-round configuration, and the result is production numbers that explode onstage. Brianna Carlson-Goodman is Eva Duarte, the glamorous woman who rose from the slums to become Eva Peron, the First Lady of Argentina, doing anything and everything she could to get there, and whose descent was just as rapid as her rise, dying at the age of 33 in 1952. Her funeral and the throngs who turned out to mourn her (“Requiem”) open the production, and the narrative quickly turns to her early years as part of a large, struggling family in the rural town of Junin. John Cudla’s Peron is dashing, strong, a canny politician and ruthless when he has to be, parlaying a military career and other government posts to a near-stranglehold on the country. Despite their flaws, the Perons’ willingness to combat poverty and empower workers won many hearts and is still admired by some in Argentina to this day. To fill in some of the gaps in the narrative of the sung-through production, Rice and Webber decided to go with a narrator in the person of Che, a one-man Greek chorus and a character loosely modeled on the revolutionary Che Guevera, who was Argentinian by birth. 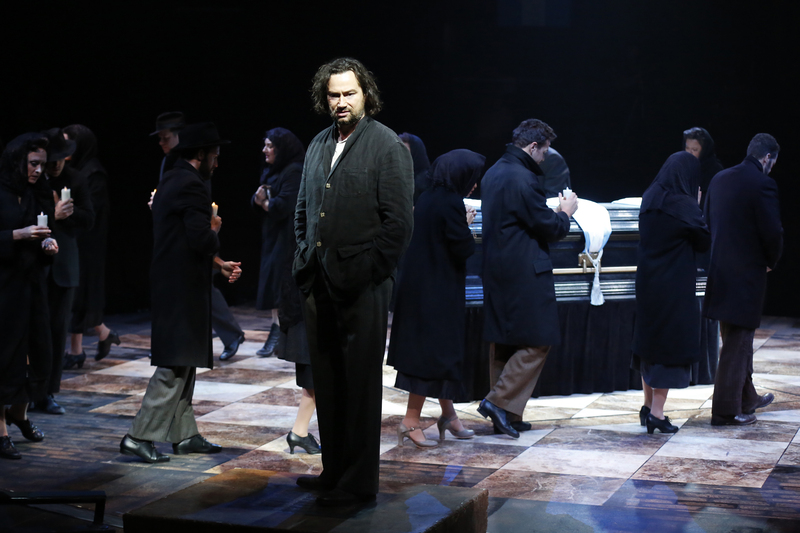 Constantine Maroulis as Che has the rock-ready voice we saw in “Rock of Ages” and here he shines as the gritty, cynical, sarcastic observer of what is going on, especially behind the scenes as the Perons first rise to power and then move to consolidate that power. Nick Adams is the silken-voiced Argentinian crooner Augustin Magaldi, the tango singer who “befriends” Eva early on only to join an ever-growing pile of discards Eva climbs over on the way to becoming First Lady. The construction of “Evita” – sung through with no dialogue – means every song tells a story and then some, so everything we know about a character comes from the song or Che’s asides to us. As a result, several of the musical numbers are simply devices moving the story forward. But when the score is allowed to focus on the moment, there are some truly lovely, magical numbers, and I’m not necessarily talking about “Don’t Cry For Me, Argentina,” the score’s best-known tune but not necessarily one of its best. That would probably be the ballad “High Flying, Adored,” or the equally lovely “Another Suitcase in Another Hall,” sung by the mistress (Julia Estrada) displaced when Eva finally persuades Peron to take her home. When legends die young, they leave behind an unfinished story, a half-finished portrait of what might have been. That was the attraction a young Tim Rice felt, and the one we still feel today. Kenkel and company do a fine job of reminding us why so many cared then, and why so many still do. The North Shore Music Theatre production of “Evita.” Music by Tim Rice, lyrics by Andrew Lloyd Webber. Directed and choreographed by Nick Kenkel. Scenic design by Bert Scott. Lighting design by Jose Santiago. Sound design by Don Hanna. Music direction by Mark Hartman. At the North Shore Music Theatre through Oct. 8. nsmt.org.